Torn from their homeland, two Jewish sisters find refuge in Sweden. It's the summer of 1939. Two Jewish sisters from Vienna—12-year-old Stephie Steiner and 8-year-old Nellie—are sent to Sweden to escape the Nazis. They expect to stay there six months, until their parents can flee to Amsterdam; then all four will go to America. But as the world war intensifies, the girls remain, each with her own host family, on a rugged island off the western coast of Sweden. Nellie quickly settles in to her new surroundings. She’s happy with her foster family and soon favors the Swedish language over her native German. Not so for Stephie, who finds it hard to adapt; she feels stranded at the end of the world, with a foster mother who’s as cold and unforgiving as the island itself. Her main worry, though, is her parents—and whether she will ever see them again. When I was a tween and teenager I devoured Holocaust historical fiction. A Faraway Island is the first thing I've read about Sweden's participation in saving Jews before and during WWII. In the late 1930s, several hundred children were evacuated to Sweden to live with foster families until things were safer in Europe. This book tells the story of two fictional girls from Vienna, 12-year-old Stephie and her younger sister Nellie (about 7 years old) who come to Sweden in 1939. They live on a remote island in Sweden, populated mostly by fisherman and tourists in the summer with two foster families. The book is told from Stephie's perspective as she struggles to adjust to life in Sweden. Stephie's story is depressing. It's my main criticism of the book. Eighty percent of the book is one long tale of gloom. Everything is miserable in Stephie's life - her foster mother is harsh, she doesn't fit into Swedish culture, has no friends, is jealous of her little sister, etc. Nellie's life on the other hand seems perfect - she loves her foster family, has loads of friends, becomes more Swedish than Austrian..is just perfectly happy. In many ways, this seems realistic. It's a lot harder for a 12 year old to adjust to a new life, especially because she has more awareness of the horrors back home. But reading a book where every page is just one more sad story after another gets a bit tiring. Thankfully, things get wrapped up toward the end and seem happier. But the "fix" is so quick that it's awkward. Having everything resolved in one fell swoop rather than having things slowly adjust over the course of the book seems unrealistic - more appropriate in a book for younger readers than this book targets. 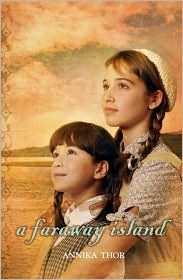 Regardless of its flaws, A Faraway Island interests me enough in Stephie and Nellie's lives that I'm really hoping that the remainder of the series are translated into English soon. I've wanted to read this book because I saw it compared to the timeless stories like Anne of Green Gables, but your review doesn't make it sound fun like Anne at all!